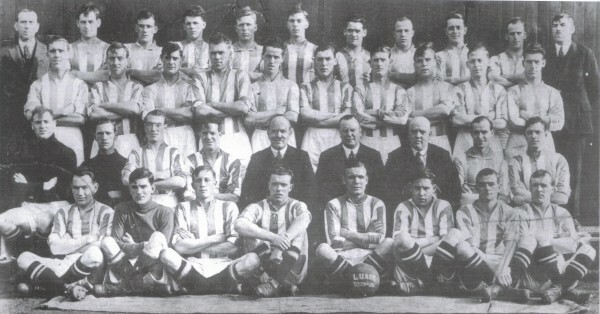 Pictured Above: John Joe Flood pictured in the 1923-24 Leeds United squad, back row seventh from left. John Joe Flood was a really gifted footballer and a vital part of the first great Shamrock Rovers team, which conquered Irish football in the 1920s. As a player, John Joe was speedy and physical, with plenty of skill and tricks with which to baffle opposition defenders. Playing at inside forward, his goal-scoring record was steady rather than prolific throughout his career. But, now and again, he would augment his consistency with a burst of spectacular scoring. Such moments often came in the big games, and showed his mental toughness, another of the traits that made him such a valued footballer. He was a real Ringsend boy. He was born on August 2nd 1898 and first lived at 5, Irishtown Road. Shortly afterwards, he moved with his family to Shamrock Terrace in Ringsend, the very street that gave Shamrock Rovers their name. It was his earliest connection to the club that he became forever linked with. In 1920, after he had showed his talent in junior football with Windsor Rangers and St Patrick’s of Ringsend, he joined Shamrock Rovers and began his rise to the status of club legend. Rovers played two seasons in the Leinster Senior league before they reached the top level League of Ireland in 1922. They immediately began to grab their glory, the new kids on the block proving that they were better than anyone else and, at the end of the season, Shamrock Rovers were the new champions. They finished five points clear of their Ringsend rivals, Shelbourne. A huge factor in Rovers’ success was their forward line, known as the ‘Four Fs’. Still famous in present-day Ringsend, almost a century later, the Four Fs were made up of Farrell, Fagan, Fullam and Flood. Following the league victory, in the close season of 1923, some of Rovers’ players were tempted away from the club by offers to play for English clubs. The chance to play at a higher standard and earn better wages was an attractive proposition and John Joe wanted to give it a try. He joined Leeds United for the 1923/24 season, but the move didn’t work out for him; he couldn’t get a game, so back he came to Ringsend and Rovers. Times were good again and in his first season back, John Joe helped Rovers win three major trophies: the League of Ireland, the FAI Cup and the Shield. He showed the attacking side of his game in the FAI Cup, scoring in the semi-final and in the first ‘Ringsend Derby’ cup final against Shelbourne. In addition to that treble of trophies, Rovers also defeated Glentoran of Belfast in a challenge match. Now they could call themselves All-Ireland champions. His impressive performances that season got him noticed again in England and the newspapers reported that he was certain to move to Manchester United for a large transfer fee. Other press rumours connected John Joe to Liverpool and Manchester City but it turned out that all the predictions were inaccurate. For the time being, he stayed with Rovers and played in their 1926 FAI Cup win, before moving to South London to play for Crystal Palace. He had a better time of it in London than he had done a few years earlier in Yorkshire, and made more than 20 appearances in the 1926/27 season. But, despite that move working out well, in 1927 he came home to Ringsend. He returned to Dublin satisfied that he could make a success of himself abroad. He rejoined Rovers for the 1927/28 season. Possibly, like other Ringsend born stars of Irish football from the 20s and 30s, he just couldn’t settle away from Dublin. Like Bob Fullam and Babby Byrne, they all left Ringsend, and left Rovers, but they all kept coming back again. When he got back from London he was 29 and had gained valuable experience. He put it to good use and straightaway began to show everyone what a valuable player he had become. He battled and ran, blocked and shot but, despite all his efforts, in his first year back with them Rovers fell just short. They finished second in the league and were without any other trophies in 1928. But it would be a long time before Shamrock Rovers finished empty handed again. Next season, John Joe scored twice to help win the 1929 FAI Cup final. It was the first of five consecutive FAI Cups he won with Rovers. And 1929 was perhaps John Joe’s best year in football, particularly in terms of high profile goal-scoring. Exactly two weeks after he got his cup final goals, he made his international debut for the Republic of Ireland in their game against Belgium. And what a debut it was! In a way, the game perfectly displayed all the qualities for which John Joe was known. The report of the match in the Irish Independent tells how, 38 minutes into the first half, which the Belgians were dominating, John Joe bundled in his first goal “from almost a prone position”. Even as he fell to the turf, he made sure to score! Then Babby Byrne scored to make it 2-0 to Ireland. With less than 20 minutes left, John Joe was put through on goal. No defender could catch him, and he scored his second past the Belgian keeper. Then, the Belgians came alive and attacked dangerously, but they were foiled by determined Irish defending. And when John Joe was played in by Jimmy Bermingham, he beat the advancing goalie to “calmly slot” in his third goal. Three goals, and on his debut! Not only that, he was the first player to get a hat trick for the Republic of Ireland. That was a fine day for John Joe. And he had many more. John Joe played the game almost a hundred years ago, but he played like a thoroughly modern midfielder. In his era, most players stuck rigidly to a set pattern of play and never strayed from their assigned position in the team. His position was at inside right but he played like he owned the field and he ranged all over it with spirit and awareness, never getting in the way of his teammates and nearly always finding the right place to be. He was a hard man on the pitch with a physical style of play that earned him the nickname “Slasher”! As well as his energy and understanding of the overall game, he was quick, very quick. In 1933, John Joe finally ended his Rovers career. In his years with the club, he won fourteen major trophies and became a champion of Ringsend football. For his country, he scored four goals in five games. Any top striker would die for such a record. His love for the game was such that, well past his 50th birthday, he was a player/manager in the Leinster leagues. He is still remembered in Ringsend. The local football aficionados talk of him with great clarity, as if they’d seen him playing only last Saturday. John Joe Flood of Ringsend, Rovers and Republic of Ireland. He was quick, very quick. And hard.